Building information modelling (BIM) is all about collaboration and better information management, aspects that are key to the success of projects. And the bigger project teams get, the more important it becomes. Guy Hammersley, former executive director and group director for BIM at BRE, an international, multi-disciplinary building science organisation, points out that if the information management on a project is poor one gets mistakes, which leads to reworking, as well as clashes, which results in inefficiency. “It’s waste. It’s waste material, it’s waste time, it’s waste effort,” he stresses. “It costs time, it costs money and it results in more carbon. So if we can improve information management, then we can add value to the project and we can reduce carbon,” he states. Hammersley explains that cost, waste and carbon are all intimately linked. Therefore, if one reduces the amount of vehicle movements on a construction site, it will save time, money and reduce emissions. Referring to the saying “Begin with the end in mind”, Hammersley proposes that the complete BIM process is actually driven by the needs of the clients, the owners of the asset, and that, at the end of the day, the real benefits of BIM lie in the operational phase of an asset. Full thanks and acknowledgement are given to the Construction Climate Challenge (CCC) and BRE for the information given to write this article. 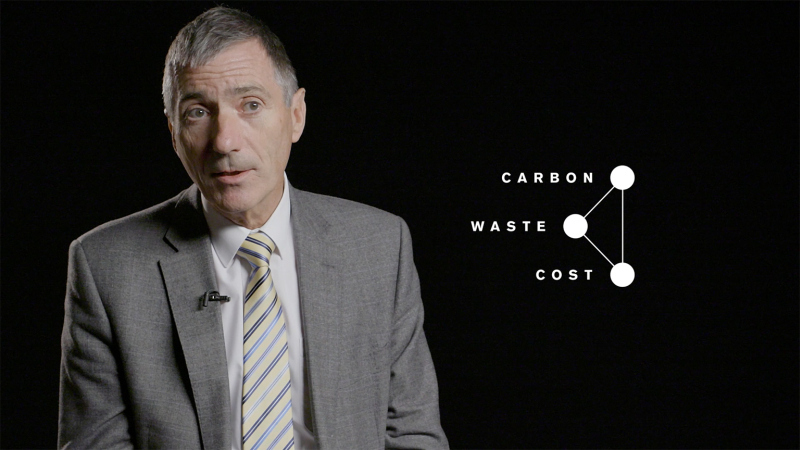 Caption: Guy Hammersley, former executive director and group director for BIM at BRE, explains that cost, waste and carbon are all intimately linked.